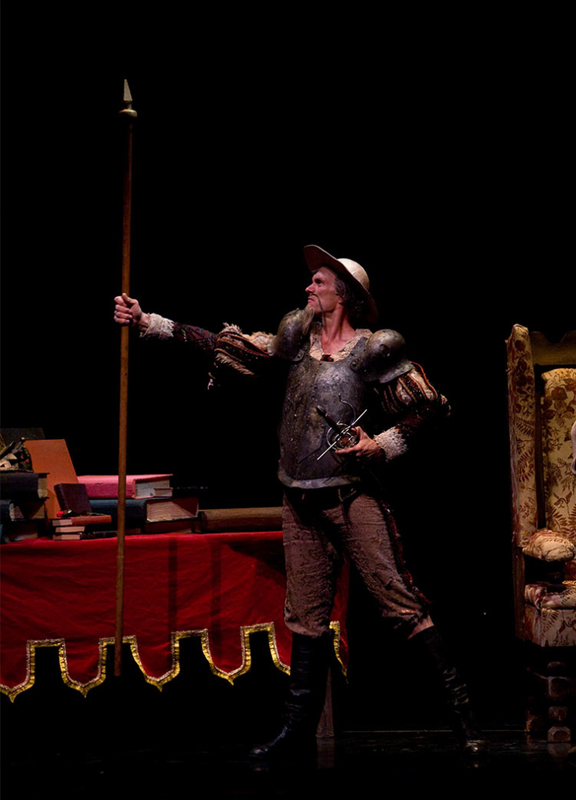 Daniel Baudendistel as Don Quixote in Ballet Arizona’s “Don Quixote.” Choreography by Ib Andersen. Photo by Rosalie O’Connor. At the port of Barcelona, the lovely Kitri seeks out her sweetheart, the gallant young barber, Basilio. Their happy meeting in the square is interrupted by her father, the innkeeper Lorenzo, who tries to force her into accepting the hand of Gamache, a rich nobleman. She refuses and with Basilio takes part in the festivities of the townsfolk. The joy of dancing is broken up by the arrival of the Don and Sancho Panza, who becomes the target of some horseplay by the villagers, until his master rescues him. As Kitri dances with Basilio, Don Quixote imagines her to be Dulcinea and kisses her hand. In the confusion that follows, Kitri and Basilio run off to get married with Lorenzo and Gamache in hot pursuit. Don Quixote and Sancho Panza set out after them to right all the wrongs. The lovers, seeking shelter on the plain of Montiel, encounter a troupe of gypsies. The gypsies discover they have nothing worth stealing and, instead, they seize and rob Lorenzo and Gamache. When Don Quixote and his squire appear, the gypsies hide Kitri and Basilio and distract all their guests with dancing and a puppet show. Don Quixote, becoming confused, sees the puppets as enemies and attacks them, causing a scene. During the mayhem, the group scatters, leaving the Don exhausted and alone. Lying unconscious from his wounds, Don Quixote dreams he is in a magic garden where the Queen of the Dryads brings a grateful Dulcinea to him. He declares his love for her. The dream fades, and rousing himself, he sets off once more to find his lady, with the help of Sancho Panza. 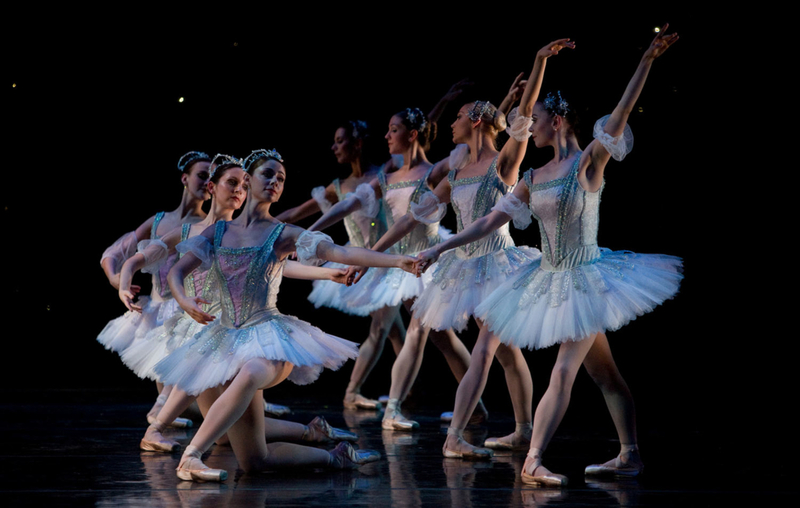 Ballet Arizona dancers as The Dryads in “Don Quixote.” Choreography by Ib Andersen. Photo by Rosalie O’Connor. Kitri, Basilio, and their friends are celebrating their escape in a tavern when Lorenzo and Gamache, with Don Quixote and Sancho Panza not far behind, arrive. Lorenzo is determined to marry his daughter to Gamache. In desperation, Kitri and Basilio decide to try playing a last trick on Don Quixote. Basilio pretends to stab himself in jealous despair, while Kitri implores the Don for help. In his pursuit to right a wrong, the Don forces Lorenzo to bless the young lovers before they are parted forever. Indignant, Gamache challenges the Don to a duel and is defeated. The lovers are united. Don Quixote gives his blessing to the young pair and the whole village rejoices, dancing in celebration of the newlywed couple. 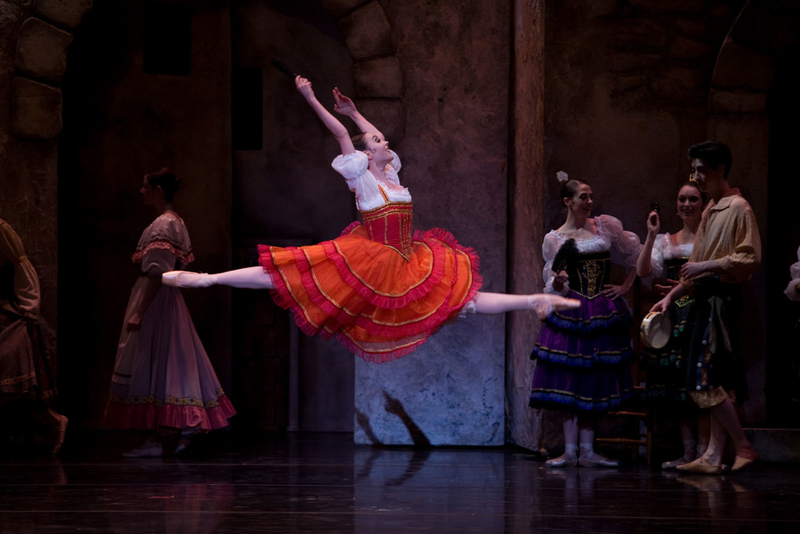 Ginger Smith as Kitri in “Don Quixote.” Choreography by Ib Andersen. Photo by Rosalie O’Connor.